When you hear about email scams on the evening news, the reporter is usually interviewing an elderly couple, but we were recently made aware of a scam that targets practicing attorneys. 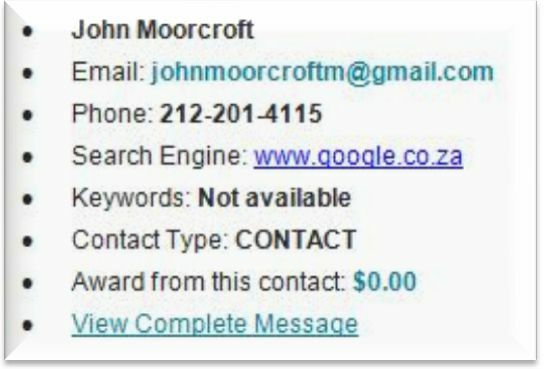 This scam generally uses the name "John Moorcroft" and there are several business names the scammers use, including Steelmax Corporation, Adey Steel Ltd., and Red Band UK LTD.
And here is the complete message. As you can see, there are no immediate red flags, nothing that screams "SCAM!" However, as time goes on and as the attorneys begin emailing with the scammer, it becomes obvious that there is something amiss. The lesson to be learned is that if it smells fishy, it probably is. And just like any e-mail scam, the same recommendations apply: do not share personal information, do not accept payments and of course do not give out any banking information or routing numbers. Have You Been the Target of This Scam? If you've gotten an email like this or have fallen victim to this scam, be sure to file a complaint with the Internet Crime Complaint Center (IC3), a partnership between the FBI and National White Collar Crime Center. The IC3 complies data from all complaints and disseminates the information to federal, state, local, or international law enforcement agencies as they see fit. Also, we want to hear about it! Please comment here and let us know who contacted you and how they phrased their request. This will help others recognize the scam and steer clear of it. Another way to warn others is to share this article. By spreading the word, we can help protect other attorneys from falling victim to these increasingly sophisticated scams. Share on Facebook, LinkedIn, Twitter, or anywhere you think it will benefit other attorneys. And, to ensure that you never miss an important update on all things attorney marketing, be sure to subscribe to our weekly newsletter, where we give you the skinny on what's hot, what's not, and what you need to know now to improve your practice and beat out the other guy. Five Email Components That Scream Out, "This is a Scam!"